The Buddha Park in Kushinagar town of Uttar Pradesh, on February 11, witnessed a large gathering of people from Musahar and other marginalized communities of the district. They had come together for a public meeting organized by Musahar Manch, with support from Vigyan Foundation and our Uttar Pradesh & Uttarakhand Regional Office, on the issues faced by unorganized workers from these communities. Musahar Manch, a community-based platform formed with our support almost a decade ago, has been helping Musahars, one of the most marginalized Dalit communities, in their struggle to access rights and entitlements. This public meeting gave a platform to the unorganized workers from deprived communities to talk about issues related to work and social security. Several of them shared that despite holding a job card under Mahatma Gandhi National Rural Employment Guarantee Act (MGNREGA), they were not getting 100 days of work. The issue of landlessness among Musahar communities was also raised by the community leaders. 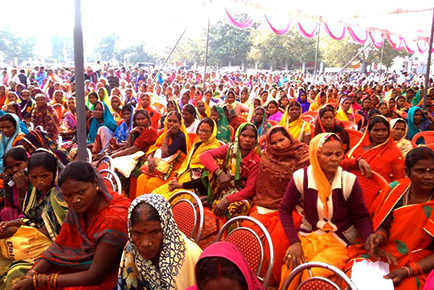 The District Magistrate (DM), Kushinagar, and the Chief Development Officer, Kushinagar, were present at this meeting that saw the participation of nearly 5,000 people, including more than 3,500 women. During the programme, Musahar community leaders submitted a charter of issues to the DM. The list included the need for land titles for both homestead and agricultural land, and ration cards for all Musahar families; fixing Rs. 500 as the minimum daily wage and Rs. 5,000 as the minimum monthly pension for unorganized labourers; announcing 150 days of work under MGNREGA; provision of unemployment allowance for workers in case of non-availability of work under MGNREGA; identification and regularization of all labour posts; and provision of drinking water, shade and toilets at all labour posts. While addressing the gathering, the DM assured the Musahar community about the district administration’s commitment towards ensuring the rights and entitlements of Musahars. He announced that the Musahars would very soon be allotted land titles – for homestead as well as agricultural land – and that their issues pertaining to housing, work under MGNREGA and social security would be addressed.